What Year Is My Fargo? : Since 2008, Salsa Cycles has had a Fargo in the line up in one form or another. Maybe you've landed here and wondered how you could tell which year your Fargo is, or how the various generations differ. In this section of the page here, I will attempt to demonstrate the different Generations and what changes the Fargo has seen since being introduced in late 2008. Gen 1- 2008-2010: The first Fargo was the non-suspension corrected model designed for drop bars and came in Fun Guy Green only. It had the red/ dark green graphics in the "Mexican" style, which Salsa had been using in one form or another since re-branding after Salsa founder Ross Schafer sold the company to QBP in the late 90's. An example of Gen 1 is posted in the review below. Gen 2- 2011-2012: The Fargo evolves by getting a suspension corrected geometry so it can be fitted with an 80mm travel fork. It also went to a new tubeset dubbed "Kung Fu CroMoly" vs the previous "Classico" tubing. A replaceable rear derailleur hangar is also added. Colors were "Creme Scheme" for the complete and Fun Guy Green as the frame set option. Also in 2011 the Fargo became available as a titanium frame which was made by Lynskey in Tennessee. In 2012 the new year brought the Fargo into two complete spec options with the Fargo 3 being the Fun Guy Green and the Fargo 2 being the Creme Scheme. The Lynskey made frame continues as the titanium frame only option in 2012. Graphics are now the "Woodcut" style with the exception of the titanium frames which feature a bead blasted "Salsa" font and model name only. Gen 3- 2013: Big changes in offerings and a small variation in design, as the Fargo gets a 44mm head tube diameter to accommodate the increasingly popular tapered steer tube forks. The Ti Fargo frame option is now made in Taiwan, but still unpainted for '13. Steel Fargos are the Fargo 2 in "Deep Brown" and the Fargo 3 in "Deep Blue" with Deep Brown being the frame set option. Both steel models were featuring the Woodcut graphic style. The titanium model is offered as a complete but is still featuring bead blasted, simple graphics. Gen 4- 2014-2016: Another leap in geometry with a switch to a suspension correction for the more common 100mm travel fork. However; the biggest change is Salsa's finally giving in and putting the Alternator Drop Out on the Fargo. A new, half painted titanium frame look is introduced, and a carbon "Firestarter Fork" is installed for 2015. The Fargo 3 for 2014 is Mustard, the Fargo 2 being Bomb Pop Blue and came with the Firestarter fork. The Ti Fargo came with the Firestarter fork and had a deep, navy blue painted front half with a polished titanium rear. Steel frame set option remains and is the Bomb Pop Blue. All bikes feature a simple, "Salsa" logo and model logo for graphics. 2015 colors remain the same on the Ti Fargo. A new model is introduced and the Fargo is offered for the first time with a suspension fork. Dubbed "Fargo 2 Suspension" it came in "Red Orange'. The regular Fargo 2 with the Firestarter rigid carbon fork was offered in Bomb Pop Blue or Gun Metal Grey with the Gun Metal being the frame only option. Fargo 3's were offered in Mustard or Green Machine. 2016 models drop the numerical designations and titanium disappears for now. The top of the line Fargo for '16 is the "Fargo SUS X9" in black which is also the only frame option color. The next down the line for '16 is the "Fargo X9" in Red with the Firestarter Carbon fork. The next in line is the "Fargo X7" in Green with the Steel Firestarter Fork. Graphics for '16 were subtle but had various little "tattoo like" details here and there. Gen 5- 2017-19: With the dropping of the old El Mariachi from the Salsa model line, the honor of the the longest lived model in Salsa's current line now goes to the Fargo, which was introduced in the fall of '08 as a 2009 model. The Fargo gets a new frame that is boost compatible in the rear (but not the fork) and can handle a 29 X 3" tire, a 29"er X 2.5" tire, or a 27.5+ X 3" tire. The frame is steel but now made from triple butted "Cobra-Kai" tubing. The head angle gets slacked out to 69 ° and there is a split drive side drop out that allows for a belt to be used for the drive train if so desired. The Fargo line gets pared down to two models- The "27.5+ Rival" comes in Matte Warm Grey and is obviously set up with the 27.5+ X 3" wheels and tires. This is also the frame set color. It s the only model with the Carbon Firestarter Fork. The other model in the line up is the "29 GX 2X10" in Forest Service Green and has the steel Firestarter Fork. Graphics are still very subtle and retain the interesting "tattoo like' details from the 2016 Fargo. Interestingly, there is no Deadwood, which was a limited edition 2016 model that was basically a Fargo with 29+ wheels. Also, it may be that the Fargo line is not featuring a top end build because that spot in the line is covered by the Cutthroat, the "carbon Fargo" of Salsa's line up. Finally, the Fargo Sus disappears after only having a two year run. A mid-2017 re-introduction of the Ti Fargo (frame/fork only) happens (along with a rather El Mariachi-like Ti Timberjack), and the frame with carbon Firestarter fork sells out almost immediately. The frame sports only a few black logos and icons on an otherwise polished titanium frame. Geo is identical to the steel offerings. For 2018 the Ti Fargo carries over as a frame/fork only. The "27.5+ Rival 1" model is offered once again and the color, in a startling turn of events, is simply "Purple". This is also the frame set only color. The Fargo "GX 29" model carries over the Forest Service Green color and a new "Cream" color. Frame specs on Salsa's site say the fork has a through axle but the images clearly show a QR drop out. All else remains the same. In June of 2018 Salsa announced the 2019 Ti Fargo. The frame is identical to the '18 but now it comes with a Firestarter Boost 110 Carbon fork which sports four sets of Three Pack Bosses, a fender mount, a lowrider mount, and internal routing for a generator hub. The price is $2750.00 for the frame/fork. 2019: For the tenth year of the Fargo, color changes were the biggest news. No more "Plus" Fargo models as Fargo's were offered in 29 X 2.6" wheeled offerings only with the capability of handling the 27.5+ and 29+ wheels. Split Alternator drop outs continued for belt drive compatibility. The new Firestarter fork which was Boost 110mm spacing replaces the old Firestarter on all models now. Fargo now offered in two spec levels- Apex 1 and Tiagra 2X. Colors are Olive with orange graphics for the Apex 1 and Orange or Teal for the Tiagra. Graphics are yellow on the teal and teal on the orange. A frame set is offered, but in black. The black frame set has similar graphics to previous Fargos as well as this year's bikes but they are in metallic blue. Framesets run $999.00 and come with the Firestarter 110 fork. The Ti Fargo frame set carries over. Maybe the most obvious use of a Fargo- Bike packing. 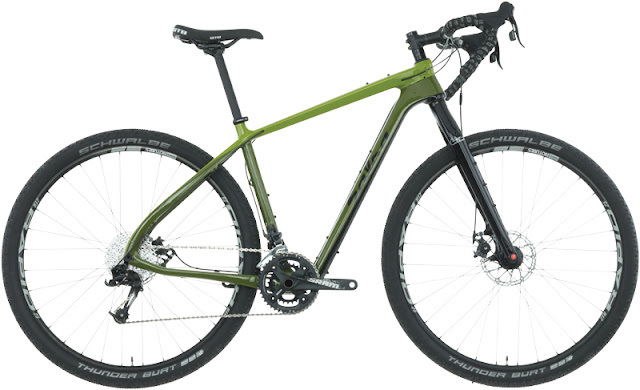 With 2016 Salsa Cycles bicycles announced the other day, it became clearer to me that the most versatile bike in the Salsa line is unquestionably the Fargo model. It is also one of the longest running Salsa models, with only the El Mariachi being in the line longer than the Fargo. In fact, one could argue that without the Fargo's influence, the El Mariachi wouldn't exist as a model in Salsa's line up anymore. Why? That would be because the Fargo was the first "Adventure by Bike" model, and the El Mariachi, being closely related to the Fargo, does a lot of the same things a Fargo can....but not all. The Fargo changed the way folks looked at the El Mar, for sure. Kept it relevant. Made it an adventure bike as well. Now it might be a good idea to take a step back here and look at just what a Fargo is. A quick image of the Fargo after my very first demo ride. "It is a fun machine. It is a ticket to places and experiences that maybe other bikes could manage, but the Fargo is made for. It does loads, it does roads, it does dirt, sand, and gravel. It can change direction in a catlike manner, yet it can ride like a magic carpet with a load on. Maybe it looks awkward, or gangly to some, but get beyond the looks and you can ride an adventure bike that can take you places and do things better than any other 29"er, (for sure) and better than most any other rig I know of that is mass produced. Dollar for dollar this Fargo will "out-fun" any other bike I have hands down. That's been proven to me, and I'm betting it will be proven out for a lot of folks. Maybe they should have named this bike the "Fun-go".......nah! To close to fungi, I suppose!" Fun. Adventure. Versatility. Yeah......that was true in 2008, and those words still define this bike for me today. 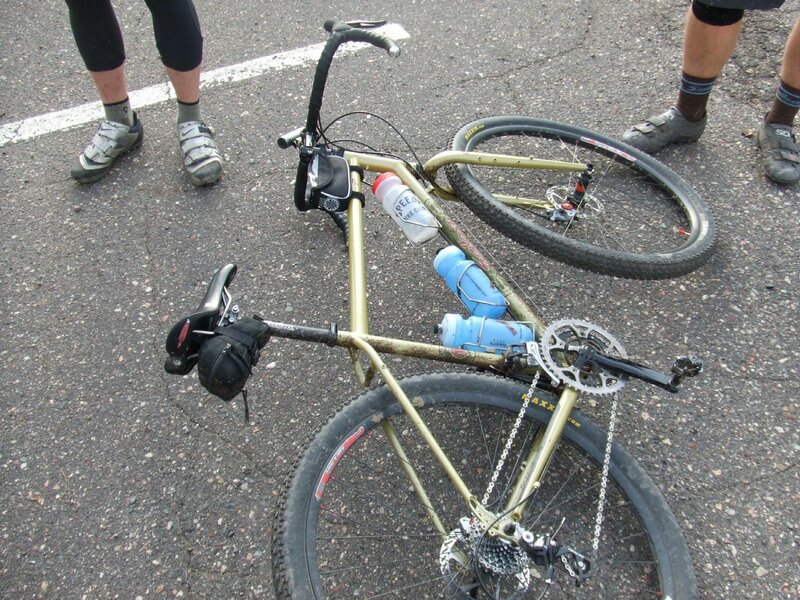 You may say, "But it is a fat-tired mountain bike! It doesn't do what the Vaya does, or a road bike. " 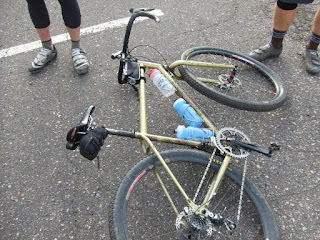 I would have agreed with you in 2008, but fortunately there are a lot of people that think outside of that box and proved that the Fargo could indeed do what the Vaya does and that it could be a skinnier tired, road going machine as well. I've seen Fargos with fenders and 30mm tires. I've seen Fargos with touring bags all over the bike. 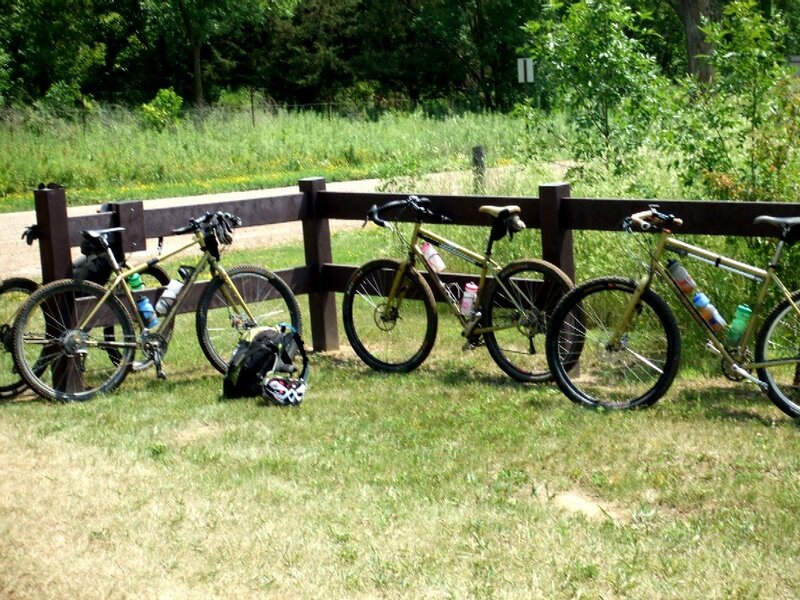 They have done RAGBRAI, world tours, gravel events, Tour Divide, and have been beer runners, townies, and commuter rigs. Heck, I even put 650B+ tires on one! 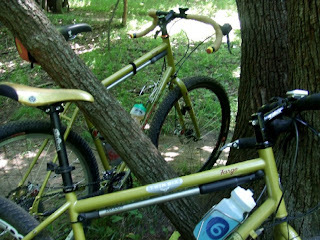 From an old Fargo Adventure Ride: Note the "alt" bar/flat bar Fargos- they don't have to be drop bar bikes. Martin's smooth tired Fargo made a great paved/gravel roller. The thing about a Fargo is that nothing has to stop it from going and doing just about any bicycle related activity. 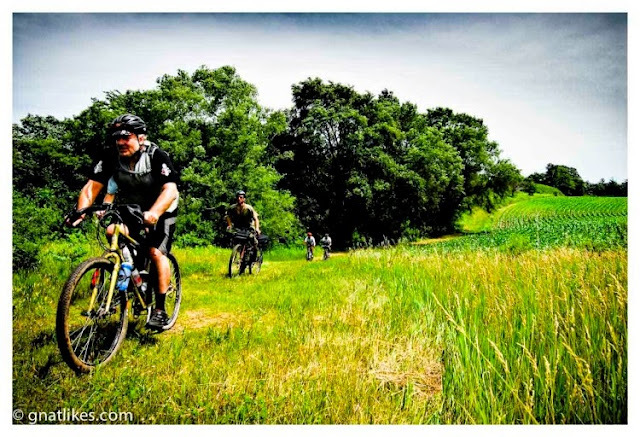 Sure- you aren't going to crit race it, and it isn't going to do what a full suspension mountain bike can do, but for the vast majority of cyclists that are wanting to ride beyond the blacktop and bicycle paths, the Fargo is almost a perfect bike for them. It can do the blacktops and bicycle paths, but it goes farther. Far-go Go-Far. Get it? In fact, I am going as far to say that the Fargo has spawned other Salsa models. Certainly the Vaya can be seen in that light. However; two new models can draw a direct line back to the Fargo. The new Deadwood, a "dead ringer" for a Fargo- (<==HA!) is really a Fargo optimized for 29+ wheels. (NOTE- The Deadwood was a one year only option. The subsequent model years of Fargos can accept 29+ wheels but are called Fargo. 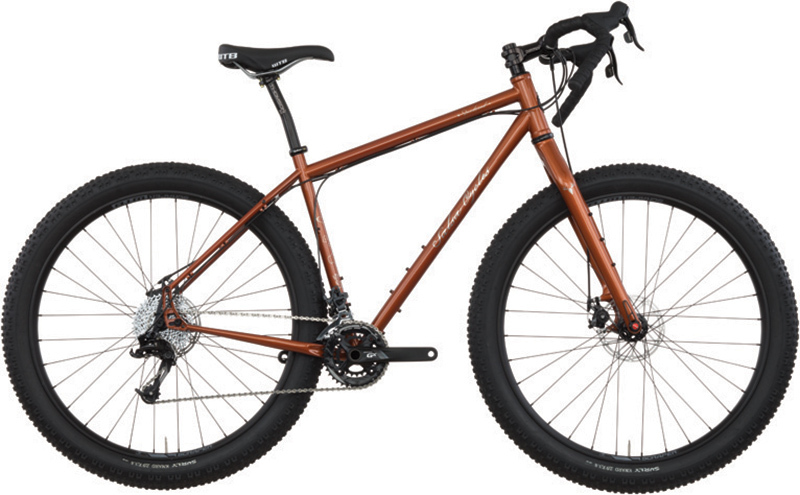 The Deadwood is now a 29+ FS bike) The Cutthroat could arguably be called "the ultimate Fargo". Stripped down, sleek, and in carbon fiber, this bike might even point to what the future of the Fargo might look like. The cycling masses need Fargo bikes, or bikes like the Fargo. Adventure. Fun. Versatility. That's what grows cycling, not the lightest, $10,000+ carbon fiber racing bike or mountain bike. People need a bike to utilize on roads that are desolate in terms of traffic, on bike paths, and on side roads that maybe are rough. They need to be able to ramble on that dirt and grass short cut, to gather groceries in panniers, and to be comfortable on. The Fargo can do all of that and more. Oh......and can we get safer roads and bicycle specific infrastructure while we're at it. Thank you. We need that too. Now, there are a lot of other cool bikes in the world as well that can do some of these things, but there aren't many- if any- quite like the Fargo. It's one of my favorite bicycles. Note: This is a "final review" I posted on my site, Twenty Nine Inches which I was the Editor for as well. This review/test started in November of 2008. 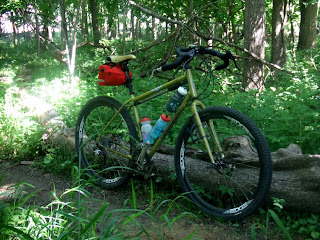 I am still riding the Fargo on a regular basis and it is one of my favorite bicycles. I posted this page on my personal blog to start to gather all the Fargo posts I have written, as it is one of the biggest draws to Twenty Nine Inches and this blog. 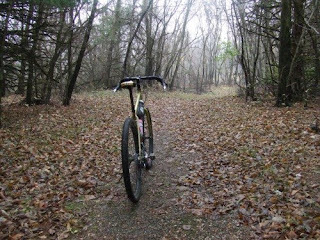 So, here is the Salsa Cycles Fargo Page and my Final Review from Twenty Nine Inches much as it appeared in 2009. The Fargo From Here To…: The Fargo here at Twenty Nine Inches is now going to be set up as a light tourer in more of a “bike packing” vein. Think minimalist gear, lighter weight than full bagged touring, and capable of going off road. The adventures will wait until I can assemble the proper satellite gear, but when I do, I’ll be back with some reports. Thanks to Salsa Cycles for providing the Fargo for review. Stay tuned for some adventures. 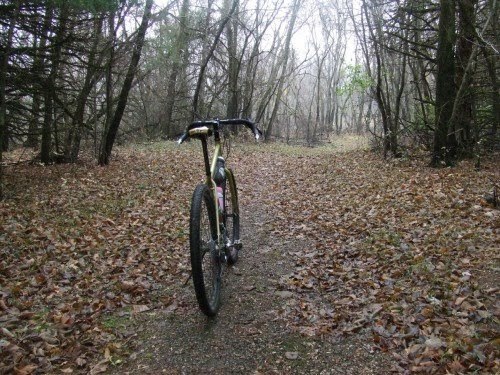 Following is the comparo I did between the Salsa Cycles Fargo and the Singular Cycles Gryphon. Both quite similar bikes. This post first appeared on Twenty Nine Inches. With the Singular Cycles Gryphon review now complete, I thought it might be helpful to put the Gryphon and the Fargo up against each other in a head to head comparison. These two 29 inch wheeled rigs are very similar bicycles, but they do differ in important ways. Obviously, the fact that these are both drop bar specific designs figures heavily into their similarities. But beyond the obvious, there is much more that may surprise you in the comparison of these two models. The Contenders: Although the Salsa Cycles Fargo pre-dates the Gryphon in the consciousness of riders, the fact of the matter is that the Gryphon and the Fargo were in development at the same time, making their similarities all the more amazing. Both conceived of as drop bar specific designs, the Fargo and the Gryphon are also not designed with suspension forks in mind. (Editor's Note: Obviously, this was true prior to the Gen 2 Fargo being released) This sets both bikes apart from the rest of the 29″er herd already. While the reasoning for such bicycles may escape some readers, I am not going to delve into that here. This report will focus on which of these two bicycles might work for you. You’ll have to figure out if any of these bikes makes sense beforehand. I find the numbers for these two bikes rather telling. Considering that neither was aware of the others decisions during the development process, and it is even more interesting. The Singular is designed as a “Bike for just riding”, an “all-rounder off road rig”, if you will, while the Fargo had a more specific touring bent in its design- An off-roader capable of carrying a load. So even with these different distinctions going in, the numbers come out very similarly, and not surprisingly, so does the ride performance. The Differences: That said, there are obvious places where the two bikes are really different. Upon glancing at the numbers, the chain stay length, the head tube length, and effective top tube lengths may jump out at you. To my mind, the biggest difference maker in all of these numbers is the chain stay length, and this in particular affects how the Fargo rides off road in comparison to the Gryphon most dramatically. The Fargo feels longer back there, and in comparison to a Gryphon, it doesn’t feel as easily led around a corner, or that it pins the rear wheel as well on a climb. Certainly, the Gryphon’s slightly steeper geometry also lends a feeling of quickness, but it is how the back ends of these bikes feel different that is most noticeable to my mind. The head tube length isn’t all that big a deal, other than it does allow for a higher front handle bar position on a Fargo without resorting to a ton of spacers. The Gryphon supports a racier position with its shorter head tube. Effective top tube length on the Gryphon does a similar thing, although, a slightly longer stem with less, (or no), spacers under the stem would approximate a similar position on a Fargo should that be desirable. The Ride: And then it all comes down to the way they ride. I have already hinted at the issue in regards to chain stay length, but there are other differences as well. My feeling is that these bikes have very different ride qualities based upon frame tubing choices. The Singular’s frame tubing is of smaller diameter, and it is more flexible in the way you like to see a steel bike flex. That springiness that gives something back to the rider as you pedal along. This same feeling doesn’t really happen on an unloaded Fargo. However; used in its intended purpose as a load bearing, off road beast, and you will feel similar feelings as you would on a unladen Gryphon. The Fargo is definitely a stiffer bike than a Gryphon bare naked, without any touring load. That might just appeal to some folks who like a more rigid chassis, and to be perfectly honest, the Fargo still feels like a steel bike. It’s just not as compliant as a Gryphon. In some cases, the longer Fargo is more comfortable, actually. Especially in choppy terrain, where the slightly longer wheel base keeps things more in check than they are on a Gryphon. Sometimes the less stretched out, and more easily attainable upright position of the Fargo is also greatly appreciated. Slight differences to be sure, but these may tip the scale for some riders one way or the other when comparing these two off road drop bar 29″ers. As far as steering, these two bikes are so similar it is hard to say which I am riding in that regard. Not surprising when the numbers are almost identical for the front ends of these bikes. Again, the Gryphon, designed for unloaded riding, has a more supple fork, but that is to be expected here. Other than that, the Fargo and Gryphon can both be at once quick steering, yet stable as well. Oddly enough, the combination of big wheels and short fork trail figures seem well suited to each other. Conclusions: It is a niche of a niche of a niche, but even so, drop bar 29″ers have already made a big splash, and are gaining some more members to the “club”. (Rawland Draakar, Van Dessel WTF) Some of this may have to do with adventuring by bicycle, or perhaps the 29″er fans desire to “be different”, or because of an outgrowth of the “monster cross” craze. Who knows why, but the Fargo and the Gryphon have to be seen as the leaders in this area. They also have strong ties to earlier mountain bike and road bike ideals stemming back to the 19th century. Certainly, it is a style of bicycle that either sets the imagination to running, or causes confusion as to “why”. If you happen to be one of those drawn to this style of bicycle, either one of these well designed, nice riding bicycles would come with a high recommendation from me. I would advise that intentions for your riding and goals for your riding determine which model to pick. Are you riding just for fun? Maybe you want to race this style of bicycle? Perhaps light weight is a goal of yours? Then those ideals may steer you towards a Gryphon. If you want to go into the back country, camp, be self supported, or do an adventure race, like the Tour Divide, then maybe a Fargo will be your bicycle of choice. Either way, these two pioneers of drop bar specific 29″ers are great bikes to own and ride.